My 10-year old stepson’s birthday is coming up and I’ve been looking for food ideas for his party. I thought it might be kinda cool to make a homemade candy bar. 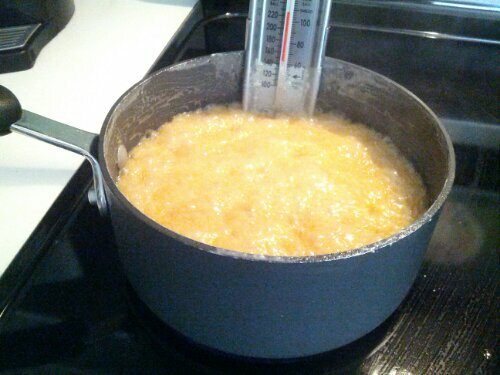 I found this recipe for Snickers bars and I figured I better try it ahead of time to see if I can make them. I only had almonds so I made copycat Snickers Almond instead of regular Snickers (I’ll make the regular peanut ones for his birthday though). In order to stick with the almond version instead of the peanut version, anywhere it said to add peanut butter, I left it out. I love regular Snickers bars but sometimes I prefer the almond ones (all depends on my mood I guess). 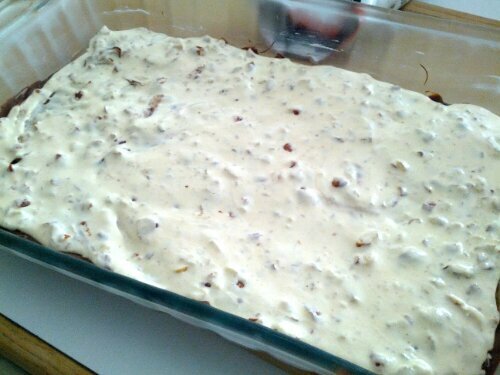 As soon as the caramel was cooked, I poured it on top of the nougat. 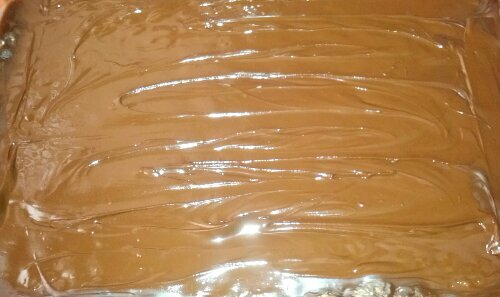 Then, while the caramel was still hot, I poured the second layer of chocolate chips on top. When they softened, I spread them with a spatula. I just tasted a little sliver off the edge because I couldn’t wait any longer – I had to know if they turned out right… and they’re actually really good!!! I wouldn’t say they’re exactly like Snickers Almond, but the caramel is a little salty and I love the salty/sweet combination so… It could be BETTER than the original…!? !